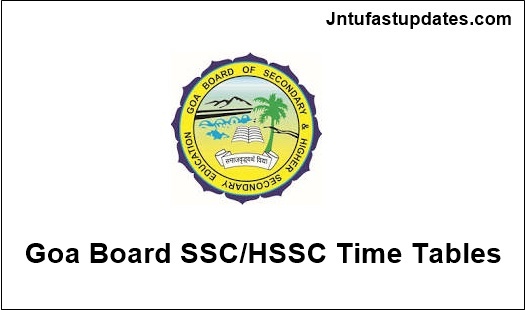 GBSHSE SSC/HSSC Time Table 2019:Goa Board of Secondary and Higher Secondary Education has released SSC and HSSC Time Table/Date Sheet March 2019 at gbshse.org. The class 12 exams will be held from February 28 to March 26, while the class 10 exams will be conducted from April 02 to April 23. All papers on each day will begin at 10 am and students will have to report at the venue latest by 9.30 am, For more details click on below provide link. The class 12 exams will be conducted from February 28 to March 26, The examination will be held at 16 centers across the state. It is clearly mentioned that under any circumstances the exams will not be postponed. For the general streams, the practical examination will commence from February 4, 2019. However, the detailed program of the practical examination will be notified later through the heads of institutions. The candidates are advised that they should get the same as certain from the heads of institutions. It is estimated that there are about 16,000 students attending this Goa Board of Secondary and Higher Secondary Education exams which are conducted last year. The pass percentage for last year examination is reported as 89% in the year 2018. Registration procedure: The registration procedure will begin in the month of November. Last year, the overall pass percentage stood at 91.57 per cent with boys scoring 91.18 percent and girls scoring, a little higher with a pass percentage of 91.94 percent in ssc results. The registration process for the examination will end on November 13, 2018. To know further details move to the below site. 1. The candidates may please note that the examination starts on each day at 10.00 a.m.
2. The date and hour of commencement of examination of respective subject should be carefully noted by the Head of the Institution and inform to the candidate(s) concerned. 3. The exact sub centres/places where the examination will be held at each centre will be announced at the concerned centre. 4. The candidates are advised to be present at the places of examination at 09.30 a.m. Late arrival beyond half hour after the commencement of examination in each subject shall disqualify the candidates from appearing at the said examination. Candidate(s) shall not be allowed to leave the Examination hall before 11.00 a.m.
5. General Stream: The Practical Examination will commence from Monday 4th February, 2019. However, the detailed programme of the Practical Examination will be notified later through the Heads of Institutions. The candidates are advised that they should get the same ascertained from the Heads of Institutions. 6. Vocational Stream: The Audit for regular students will commence from Friday 1st February, 2019. The oral and practical examination in respect of Higher Secondary Schools where the courses have been started for the first/second year will commence from Thursday 14th February, 2019. However the detailed Programme of the Audit and Practical Examination for regular and repeater students will be notified later through the Heads of Institutions. The candidates are advised that they should get the same ascertained from the Heads of Institution. 7. NSQF SUBJECTS: The practicals in NSQF subjects will commence from 22nd January 2019 and will be conducted by National Skill Development Council, New Delhi. 8. All important and relevant instructions for answering the public examination, circulated vide this Office circular No. 53 dated 04/10/2006 shall be strictly followed by all students. 9. Under no circumstances examinations shall be postponed, even though any day is declared a public holiday. Students need to open the official website “http://www.gbshse.gov.in”. Open the link in the PDF format. The board was established on May 27, 1975 under ‘The Goa, Daman and Diu Secondary and Higher Secondary Education Board Act, 1975’. It subsequently began the process of conducting examinations for Class 10 and Class 12. The GBSHSE has the power to control, manage, and direct school education in Goa. Its primary function is to plan academic programs and organise examinations, especially for state level High School Certificate (HSC or Class 10) and Higher Secondary School Certificate (HSSC or Class 12). The school-wise list of candidates registered for the March 2019 HSS examination will be displayed on the Board’s website www.gbshse.gov.in along with their seat numbers and subjects offered by January 12, 2019″.Practicals in National Skills Qualification Framework (NSQF) subjects will start by January 22, 2019, and will be conducted by the National Skill Development Council, New Delhi.